Yoshi’s Crafted World isn’t a tough platformer, which is the point it isn’t meant to be tough, so that fun is in fact having to collect items for flowers and exploring the cardboard craft created world. Yoshi’s adorable new costumes offer a huge amount of damage protection, and his signature mid-air hover can be chained almost indefinitely, allowing for some extremely forgiving platforming. 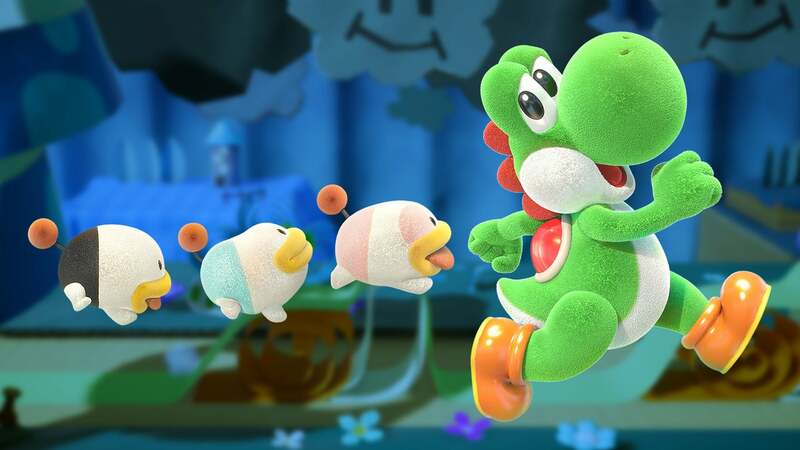 Getting to the finish line isn’t the only thing to do in Crafted World, all the levels are filled to the brim with collectables to find, many of which require either the some technical skill to aim and hit them with eggs, or the prowess to hunt for hidden secrets, or the resource management to make sure you have the eggs you need at the right moment, which at some points I found hard and got stuck sometimes in little challenges for a flower I ran out of eggs. Yoshi’s is just so adorable, and his sounds and animations as he hops and hovers around a course make every action entertaining and more enjoyable. His movement mechanics make him satisfying to control, and eating enemies to turn them into his egg-based ammo is just as amusing as it was in Yoshi’s Island 24 years ago. This time around you can actually aim eggs directly at your target, as opposed to having to time your throws with a swinging reticle, which deepened my options for how to use the classic move while simultaneously making it more accessible to do so. The 40+ are grouped into loosely themed worlds with two or three courses apiece, and everything leans into Crafted World’s adorable and somewhat photorealistic arts-n-crafts aesthetic, which looks amazing and also gave me some craft ideas for myself especially in the underwater sea level. All of the obstacles all look like homemade dioramas with floating platforms clearly held up by string, background decorations set up as painted pieces of cardboard, and pretty much everything is held together with tape. It’s an extremely charming style, which is very easy on the eye and again a new take on level design and the handmade appeal which is very popular at the moment. 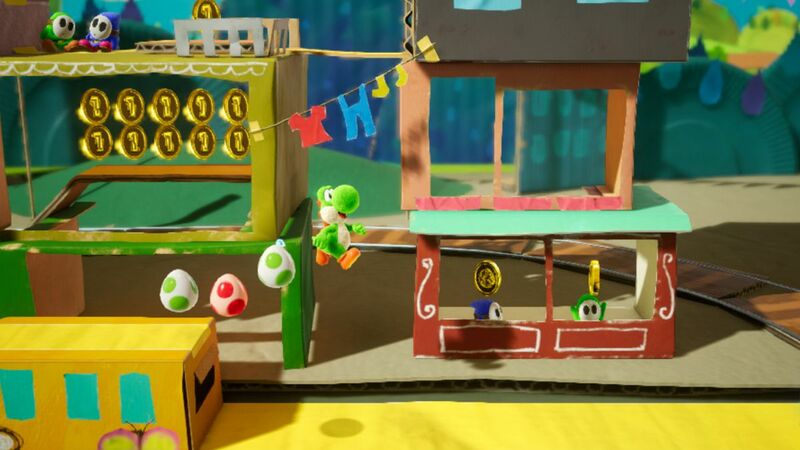 The game itself is actually set up for replays as Crafted World even excepts you to replay levels by offering up more Flowers for finding specific objects hidden in the background or foreground of a level. By flinging Yoshi’s eggs outside of his 2D running path, which it is surprisingly natural to aim where you want (though it can get a bit trickier in busy areas with lots of targets). So if one of the cardboard robot NPCs on the level select map asks you to find and hit five cows in a certain stage, you’ll have to dive back into it or uncovering a certain object etc. The levels themselves are all unique, varied, and fun to run through. Without a whole lot of real challenge to test you, Crafted World instead relies on twists and extras like this to keep it interesting. However, Crafted World does shake things up in a small but fun way with its new costume system. There are over 170 of these to collect, all available in gachapon-style capsule machines themed after the different worlds. There are also a handful of special costumes you can only get from certain Amiibo, letting you do silly things like be a Yoshi in a Yoshi outfit. Posted in games.Tagged Fun, insight, review, Switch, update, yoshi.